Traveling with kids is a constant game of trying to keep them engaged. 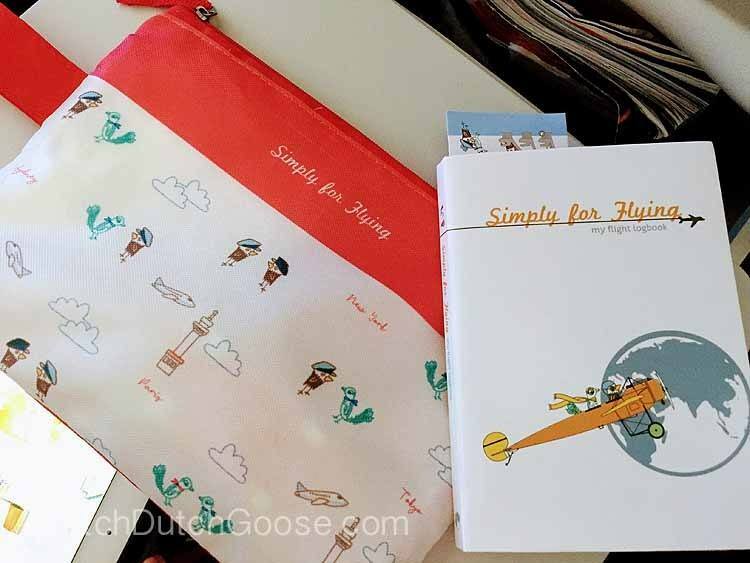 I want our kids to enjoy and remember the experiences we’ve shared together on our travels When I discovered the Simply for Flying Logbook I was blown away by the simplicity and genius of this little record book. The logbook helps you keep track of your child’s flights in a fun, interactive way. The Simply for Flying Logbook comes as part of a little travel pack. There is the travel book, a luggage tag, a passport cover and a pen. They all fit neatly into a carrying bag. We love that this bag keeps everything together and is brightly colored so it’s easy to keep track of. There’s a little fabric loop on the side of the carrying bag that my six-year-old loves to use to hook the bag to his tray table lock. Inside the book you fill out all the details for your flight. We make sure to fill in all the blanks up to the seat number (this also helps the aircrew return the book to you). I leave the other details to the flight crew. There is a little bookmark that helps the flight crew keep track of the page they need to sign. The bookmark explains the passport to the crew in English. The flight crew has a space to sign the book and write a message. They can also fill in the aircraft type, aircraft registration number, duration of the flight and distance flown. On short flights or flights where we just have the baby, we drop the log book off with the crew right when we enter the plane. We have everything all ready to hand off. It’s not necessary to send a pen up though as pilots always have a pen handy. On longer flights we wait a bit and take the book up mid-flight once the cabin service is complete. This way, you don’t get in the way of the flight attendants. My Big Little actually goes up on his own. He loves being able to ask the KLM flight attendants in Dutch to fill out the book. When he goes up alone, or with the Middle Little in tow, he always seems to come back with some treats as well. It is a wonderful way to teach him to speak to adults and ask for what he needs. We went up with him the first few times but made sure to have him ask. While the flight crew has the book we hang the whole pouch on the tray table. This helps the crew find us, but it also reminds us we haven’t gotten the book back. On several flights the flight crew has waited until the end of the flight so that the captain could give the book back personally. This is where the genius part comes in. The Simply for Flying logbook has opened up so many amazing doors for the kids on flights – literally, it has opened cockpit doors. We’ve been invited to the cockpit, received pins and airline goodies. The boys always end up chatting with some of the flight crew. On one occasion the flight crew mentioned our child by name during the announcements, much to his delight. Simply for Flying’s Instagram is full of photos of airlines going out of their way for little travelers. The back pages of the book have a space to keep track of the type of aircraft you’ve flown on. It also has a city list you can tick off. This is a wonderful little record book. I highly reccomend it for the little travelers in your life. I think this is a great memory maker regardless if you are on a plane every month or only once a year. I only wish we had found this book earlier! We received a Simply for Flying logbook in exchange for this review. We loved it so much we became ambassadors for the Simply for Flying logbook. You will often see our photos and stories featured on the Simply for Flying Instagram account. As always all opinions are our own.